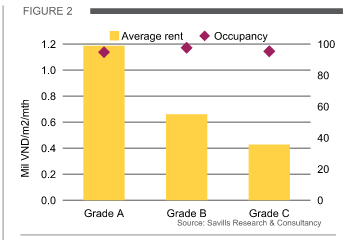 Latest report from Savills Vietnam notes better performance, especially in non-CBD areas. Grade A recorded the most improved performance, particularly in non-CBD areas, in Hanoi’s real estate market during the fourth quarter of 2017, according to the latest report from Savills Vietnam. The capital witnessed improvement performance in the office segment, with total stock at over 1.6 million sq m, up 1.6 per cent quarter-on-quarter but down 1.9 per cent year-on-year, after two new Grade B projects came online. Average rents increased 1.4 per cent quarter-on-quarter and 2.6 per cent year-on-year and average occupancy increased 1.1 ppts quarter-on-quarter and 6.2 ppts year-on-year. Newly-registered enterprises grew 11 per cent year-on-year in 2017, to 25,160. The new year will see 15 new projects supplying nearly 299,000 sq m, mostly in the city’s west. Increasing competition is expected from co-working space and officetel projects. Meanwhile, in Ho Chi Minh City, one 2,400 sq m Grade C project in District 1 entered the market. Stock was more than 1.7 million sq m, fairly stable quarter-on-quarter and up 6 per cent year-on-year. Performance remained positive. 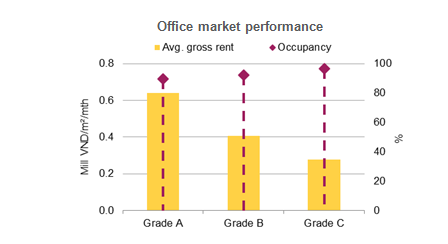 Average gross rents increased 7 per cent year-on-year, attributed to limited CBD vacancies and new Grade A and B projects launched during the year. Average occupancy was high, at 96 per cent. New supply by 2020 is expected to be up to 585,000 sq m.